Finally! The new studio album which everyone has been demanding for 25 years. It has been a long slog, but it is here. The wonderful cover art painting is by Robert McCauley and is entitled "Mixed Metaphor VII". And oh, the music. But don't take my word for it. Go ahead and read the reviews and take THEIR word for it, then follow the links and find out for yourself! Lovingly assembled by C&J fan Rachel Case, this video montage features the new version of "Homeward Bound" from ARK-eology put to a series of photos from C&J's 2008 tour. You can find it at your favourite retailer, or you can follow the links to the left to order from amazon or from CD Baby, both of whom offer digital downloads. It is also available via iTunes. 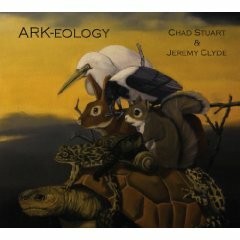 ARK-eology IS NOW ALSO AVAILABLE SIGNED FROM THE NEW CHAD & JEREMY OFFICIAL ONLINE SHOP. CLICK THE ABOVE LINK TO ADD A COPY OF ARK-eology TO YOUR SHOPPING CART. POSTAGE IS FREE IN THE USA.